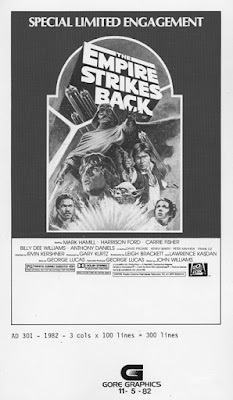 With the first of many new Star Wars films about to hit the screens for the public's consumption, dissection, and eventual acceptance or rejection, looking back at how the original films were promoted reveals several contrasts, particularly from the mindset of a collector. While it's impossible to avoid publicity for and fan chatter about The Force Awakens upon opening a web browser or scrolling through social media feeds, the era in which Star Wars, The Empire Strikes Back, and Return of the Jedi were released was one in which a considerable amount of printed ephemera was produced to raise awareness for a film's upcoming release, and word-of-mouth was all the more significant. These materials served any number of functions and were intended for specific audiences -- from theater owners and the press to charity organizations and the movie-going public. 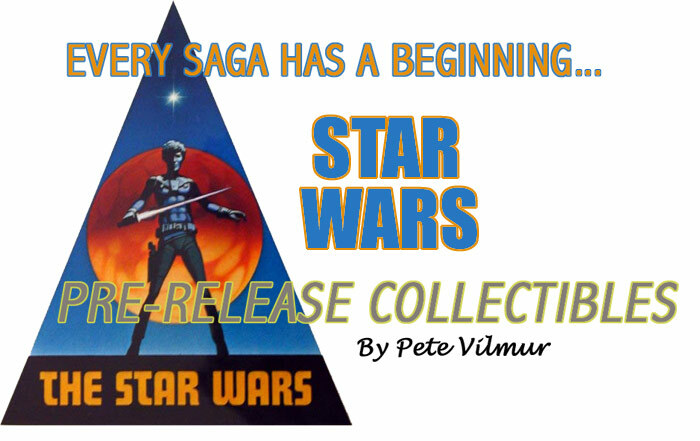 This series of posts, entitled "Star Wars at the Movies," is intended to provide a glimpse at the variety of such vintage items that collectors may find of interest. To begin, put yourself in the shoes of a small-town theater owner in 1976 surveying the cinematic horizon for upcoming titles. It's difficult to envision a time when Star Wars was an unknown commodity. How exactly did potential exhibitors and society at large become aware of "The Star Wars?" 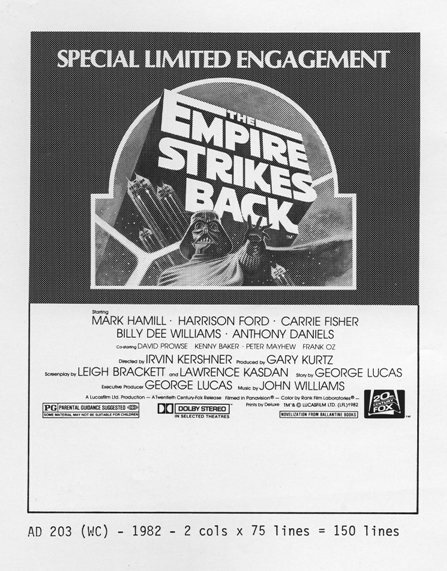 Promotional material created prior to the original film's release has a certain mystique that sets it apart from everything that followed in the movie's wake. 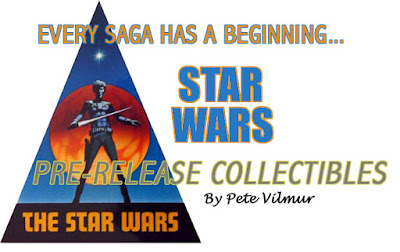 Pete Vilmur wrote an article for the Archive in 2002 entitled "Every Saga Has a Beginning: Star Wars Pre-Release Collectibles" which covers this period extensively and should be the starting point for any collector intrigued by this area of the hobby. Pete's article outlines several film marketing staples of the day (many of which persist in some form, either digital or in some cases, old fashioned print). From a promotional standpoint, the original film's pressbook represents a relatively common collectible that offers great insight into the strategies employed to "spread the STAR WARS message." The pressbook's primary purpose is to provide theater owners that might not have much in the way of an advertising background the instruments necessary to successfully promote the film via the local press. Its 19 pages are broken into sections for PUBLICITY and, not to put too fine a point on it, EXPLOITATION. Articles and blurbs describing the film in general -- as well as several that highlight its creator and stars -- are standardized and constructed to be adaptable for an exhibitor's needs, with key release information consistently included. "The most magnificent toy ever invented for grown men to play with and express their fantasies, to project their nightmares and dreams, and to indulge their whimsies and secret desires is the motion picture medium. 'STAR WARS' is a space fantasy designed to stimulate imaginations, entertain and give moviegoers an infinite variety of vicarious emotional, physical, and mystical delights. It is a world people on this earth have never been to, but it's a world they may have encountered when years ago they dreamed about running away and having adventures that no one else has ever had. The 20th Century-Fox release, opens.... at the .............. Theatre." "'Making this movie has been to George like playing with a big toy. He had a great time. While we were filming, Carrie Fisher brought over to England a Buck Rogers helium pistol. She gave the toy to George and he wouldn't put the thing down. We would see him with the gun in the hallways of the studio. Although he was not conspicuously running down the hallways and aiming it at imaginary villains, he did spend a lot of time kind of twirling it around. You couldn't pry that helium pistol away from him,' Hamill revealed." "When I was growing up [in Beverly Hills], I used to go out a lot in costumes. There's a whole subculture of people who get dressed up in strange costumes and go out for ice cream at 31 Flavors. And I remember realizing that people just won't give you the attention that you seem to be screaming for. Kids react, of course. They think it's terrific. Adults don't. Except for drunks." Beverly Hills must have been a strange place back then -- at least in a much more fun way than it is today. Perhaps most fascinating is the pressbook's EXPLOITATION section. In addition to a list of familiar licensees to consult for merchandise to be used "for promotions or as sales items at your concession counter," an array of publicity avenues exhibitors can follow are laid out in entertaining detail. From the typical trailers, TV and radio spots, and motion picture soundtrack to the local library and science fiction clubs, no stone is left unturned. "If ever a motion picture was guaranteed to catch and send the imaginations of college students soaring, it's 'STAR WARS.' Filled with incredible settings, strange galactic creatures, fantastic space battles and a story that highlights three attractive young people, George Lucas' romantic inter-galactic adventure is a sure winner on campuses. Therefore, you owe it to your box office to make every promotional effort possible to reach college campuses around your theatre with 'STAR WARS' excitement. Even though your engagement of 'STAR WARS' is scheduled for summer, remember that nowadays college campuses remain open throughout the year with many having near capacity enrollments. So scout out your neighboring colleges and get 'STAR WARS' soaring." Several bullet points plot out additional tactics for reeling in the college student market, such as inviting representatives of student newspapers, radio stations and magazines, and heads of student and faculty groups to advance screenings, inquiring at administration offices about holding Star Wars "symposiums" in film-related classes, and using print facilities to "wild post" posters and flyers (such as those pictured below) in and around campus areas where students tend to congregate. Another key component to a pressbook is a selection of ad slicks, which are camera-ready advertisements to be used by exhibitors for various print publications. These include a multitude of graphic representations of the film's logos and poster imagery in various sizes to be adapted and personalized at an exhibitor's disposal. These graphics would be placed in local newspapers, flyers, and the like, usually alongside a theater's showtime listings. Oversize slicks would be utilized for larger, sometimes full-page spreads. Stepping backwards in the process for a moment -- with the success of the first film established and a sequel on the way, it's reasonable to have expected Lucasfilm to feed the press some information on the next chapter's production. 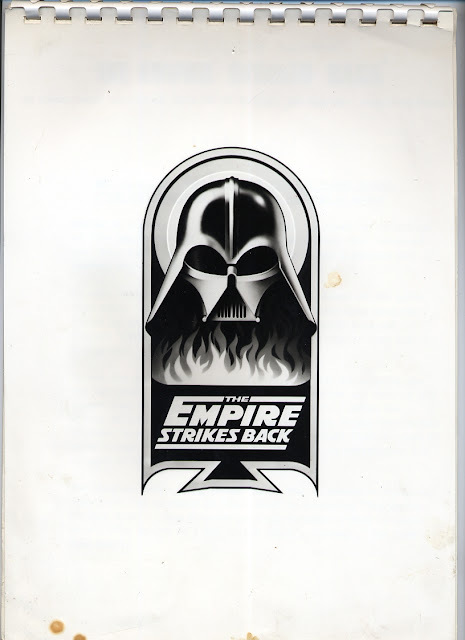 Such was the purpose of this press brief (featuring the early "Vader in flames" logo), which appears to have been for those lucky enough to visit the set at Elstree Studios near London. With the first two films having several theatrical re-releases leading up to Return of the Jedi, new advertising campaigns were created to generate publicity. 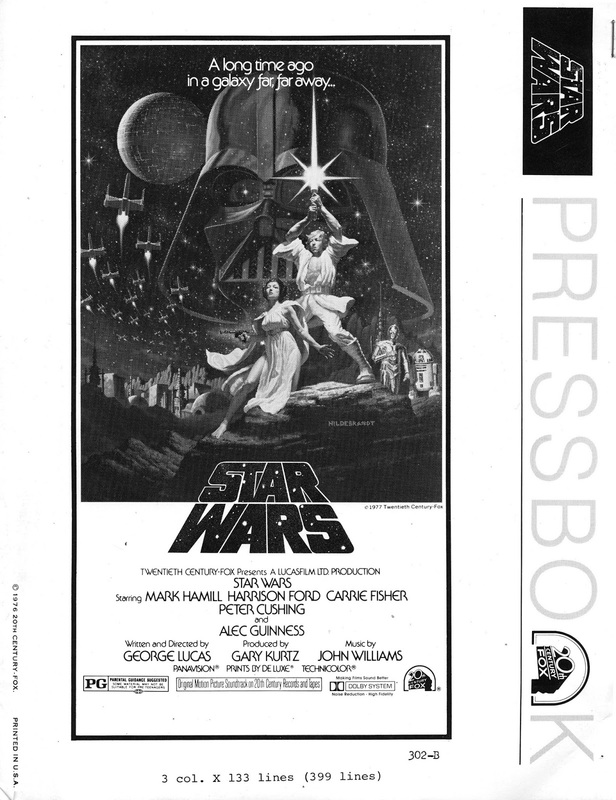 In the case of the following magazine advertisement for Star Wars' 1978 re-release, the public needed a reminder not to miss the last chance to see the film in theaters. Considering that the film wouldn't be released on home video (barring selected scenes on Super 8mm film) until 1982, it's understandable that it was a hot theatrical product -- it was re-released four times from July 1978 to August 1982. By the time the third installment was in production and getting primed for release, the Star Wars marketing machine was well oiled. Lucasfilm and 20th Century-Fox had a four page foldout supplement for the film which appeared in Variety in 1982. 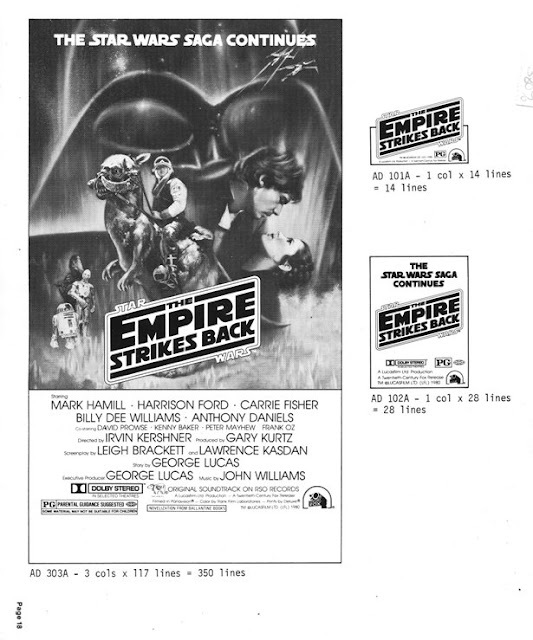 The insert features reproductions of the Star Wars Style "A" and The Empire Strikes Back Style "B" posters to promote their respective re-releases as the number one and number two top grossing films of all time, assuring that "THE SUCCESS CONTINUES..." with Revenge of the Jedi in production and slated for a world premiere slated for May 27th, 1983 (the release date would eventually be changed to May 25th to coincide with the original film's release). Confidence was in plentiful supply, and with good reason. A precedent had been set and there was absolutely no holding the Jedi campaign back at this point. 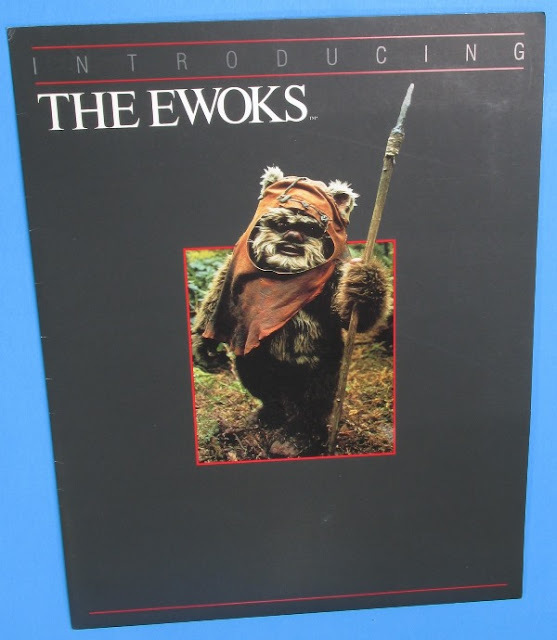 In addition to a standard press kit for the film, there was an entire press kit created especially for its set of new, cuddly, and marketable characters - the Ewoks. The kit includes a detailed background on the "intriguing race of small, furry creatures living on Endor" which describes how the film "depicts the details of Ewok life and culture." 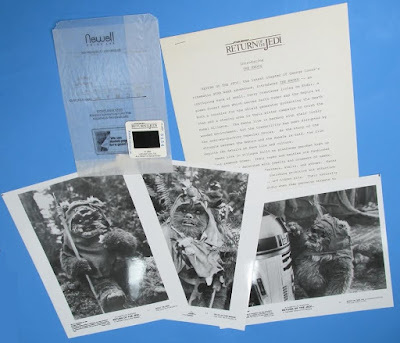 Also included were publicity stills featuring two principals of the Ewok cast -- Wicket and Paploo -- and a 35mm slide. It's a testament to how much was invested in the characters, as well as Lucasfilm's expected return on that investment. The little furballs were a major commercial constituent that demonstrated a focused marketing strategy unlike any other Star Wars characters, sticking around for two spin-off live action films and an animated series after Return of the Jedi faded from the the screen. 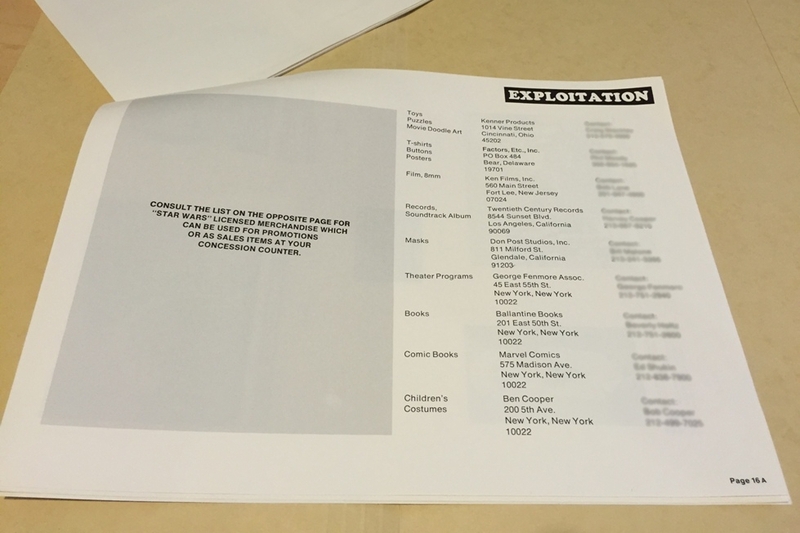 Press kits and press books were produced in numerous forms. Those created for foreign markets often present unique qualities that set them apart from domestic materials. 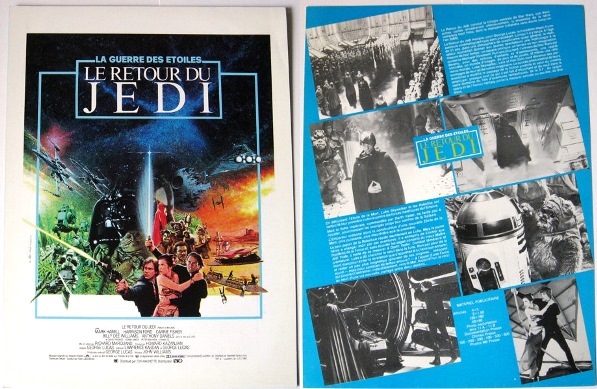 For example, this small, double-sided Return of the Jedi French press kit poster stylishly combines the country's theatrical one sheet with typical press kit information and publicity stills. A neat detail found in this item is the mention of Jedi completing the middle of three trilogies, with the first and third to be completed around the year 2000. Though it's taken a bit longer, we're on the verge of that age-old Lucas prophecy being fulfilled, and then some. Special thanks to Todd Chamberlain and Duncan Jenkins for providing images currently unavailable on the Star Wars Collectors Archive Database.